For weeks I've been bugging Emi (she decided she wanted her nickname to be spelled with an 'i' for some unknown reason) to get her own blog, and she finally did tonight! After hours spent perfecting the layout, setting the settings, writing, and finding pictures to post, it is finally up and running! As well as giving both Emi and my Mom a permanent place on my sidebar, I will include the address here, just because Emi insisted I must. So here, please make her happy by visiting her space at www.noninjasinthemorning.blogspot.com. 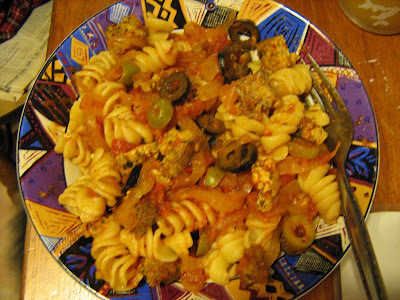 Oh, and here is a photo of the delicious pasta dinner I made, which was mentioned in my previous post. I think that tonight is the first time that I've ever eaten pasta without cheese! I was reading the comments on Stella's blog and I saw your name. So I right-clicked to get to you profile and found out that you are unschooled. And you also have links to other unschoolers' blogs. Now, I think unschooling is totally awesome!